Noble Man is a polled purebred Maine who has been used successfully on heifers for two years. 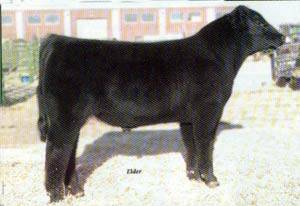 His progeny were the high selling sire group at the 2006 Green Valley Cattle Sale, Nebraska. Noble Man is homozygous black, homozygous polled and homozygous solid patterned. His daughters are very feminine and fancy, while his sons have excellent muscle expression and scrotal development. Noble Man is the outcross Maine pedigree you've been looking for to use on heifers!